Yik Yak, the anonymous social network popular on college campuses, is asking users to create user names. Starting today, users will be asked to create “handles” that they can optionally attach to their posts. The handles, which do not have to include users’ real names, will be turned on by default for every post. 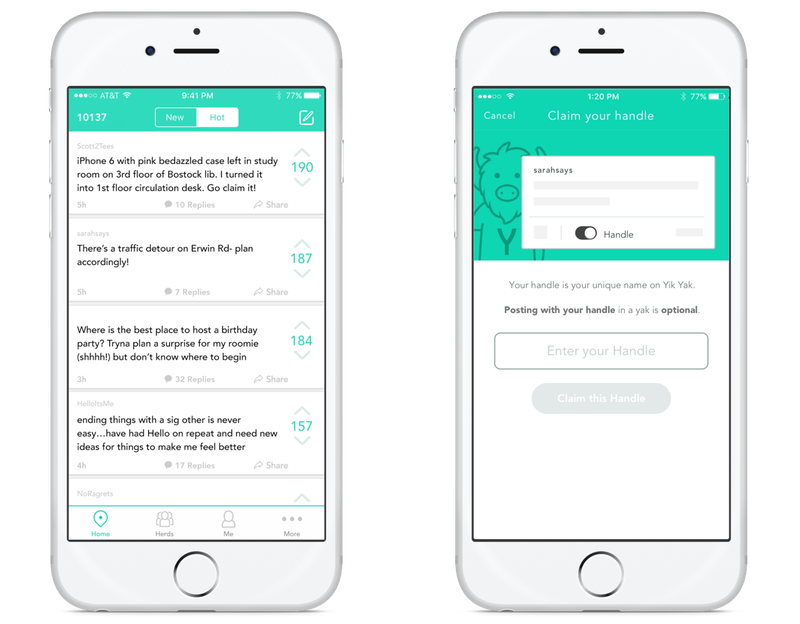 The move could help strengthen Yik Yak communities by making their best contributors more visible and trusted. But it could also alienate users who appreciate the hive-mind appeal of a service where no one has a name. Yik Yak was created by Tyler Droll and Brooks Buffington, who developed the app while students at Furman University in South Carolina. The app, which launched in November 2013, places users into “herds” based on their location. Posts are limited to 200 characters and can only be viewed by the local community. Users vote posts up and down, Reddit-style, and add comments to start discussions. The company won’t disclose how many users it has, but says that “millions” of people use the service each month on more than 2,000 campuses. It’s consistently one of the most-downloaded social networking apps, according to research firm App Annie, and has raised $73.5 million. The app’s rise has been driven by colleges, where students use it as a bulletin board for sharing news, discussing events, and commiserating about campus life. It’s become so popular that college institutions — libraries, faculty, university police — have begun using it for communicating with the student body. Along the way, various herds have produced “characters” — helpful librarians, for example, or “weathermen” who post the day’s weather along with what to wear, for example. “We’ve been seeing personalities emerge naturally,” Buffington said in an interview. “There’s a certain hunger for these sorts of interactions on Yik Yak.” Some users began signing their posts, but until now there hasn’t been a way to verify the posts’ authenticity. Allowing users to create handles will give their posts more credibility. “We’re all about forming and encouraging these tight-knit local communities,” Droll said. “We expect this to even further the connections and the closeness of this community.” Buffington noted that when the company added an icon to replies indicating when they came from the person who wrote the original post, replies doubled. For now, claiming a handle will be optional. But I wouldn’t be surprised to see Yik Yak continue encouraging users to build profiles on the network, particularly if it plans to target advertising at them. (The company doesn’t currently generate revenue.) Droll says “it lays a great foundation for future features and for future use cases.” I can imagine the service courting celebrities, politicians, athletes and and media personalities to begin posting under their real names, for example. Correction, 12:42 p.m. This article originally misstated the location of Furman University.